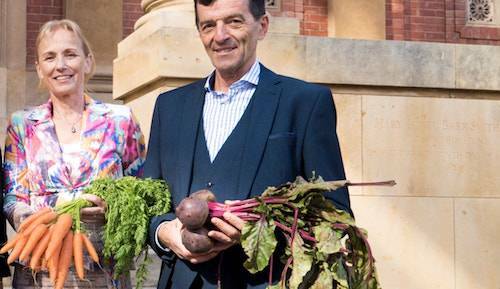 Dr. Heleen and Dr. Alphonse Roex will tour Belgium and The Netherlands in October to present three workshops on the benefits of a whole food plant-based diet. The doctors want to open hearts and minds to the benefits of a plant-based diet. Europe's heartlands of processed meats, high dairy consumption and prolific factory farming practices are about to be paid a visit by Australian plant-based doctors. Dr. Heleen and Dr. Alphonse Roex will tour Belgium and The Netherlands in October to present three workshops on the benefits of a whole food plant-based diet. Originally hailing from and educated in Holland, but now based in Australia, Dr. Heleen (a pediatrician) and Dr. Alphonse (an obstetrician gynaecologist) were motivated to return to help curb the trend of chronic lifestyle diseases affecting the region. They aim to open minds and encourage positive change through providing evidence-based education, with a side of delicious vegan catering. "Just like almost everywhere, a host of myths and confusion exists among both the general public and healthcare practitioners on what constitutes the best dietary approach," says Heleen. "This is why the workshops have been structured to present the science around plant-based nutrition in simple terms that are accessible to all, but still grounded in the research." Alphonse shares that the motivation behind creating these events is to 'let people know the good news about how this way of eating can dramatically improve chronic diseases and in many cases even stop and reverse them'. The Dr. Roex duo will be giving particular attention to explaining how applying the science of nutrition to your plate can help with heart disease, cancer and type 2 diabetes. Perhaps most motivating however, is that each workshop will include talks by patients who will tell their stories of how plant-based nutrition changed their life by greatly alleviating their disease symptoms. The workshops have been co-organized by Dr. Heleen Roex-Haitjema and Dr. Alphonse Roex in collaboration with Restaurant De Rousch in Heerlen, Emma Roche in Antwerp and The Healthy Heart in Amsterdam. The tour visits Herleen on October 1, Antwerp on October 3 and Amsterdam on October 8.